English muffins hold all that warm butter and sweet jam because of nooks and crannies. That’s a good thing. But nooks and crannies in grout permit spills, dirt, and grime to penetrate and get trapped beneath the surface. That’s not good. No amount of regular mopping can get completely clean the porous surface of grout. Dirt, bacteria and odors result. The solution? After a deep cleaning, the grout lines need to be sealed. Once your tile floor is disinfected and has that brand-new clean look, you’ll want to keep it that way. Upon request, we can apply a high-quality impregnator sealer to the grout to protect against spills, dirt, oil, and other contaminants. Sealing fills in the all those little dips and holes, prohibiting spills from penetrating, which gives you time to wipe up spills before they become stains. Sealing also makes routine cleaning and maintenance much easier. Although we provide sealing services, it has been our experience that sealers usually only last for about eight months. For a lasting, uniform look, we highly recommend our grout color sealing services. The main reasons people choose color sealing is to change the color of their grout lines and to get the best possible sealing protection. If grout lines have become stained and do not look uniform after cleaning, color sealing is the ideal solution. And like regular sealing, once your grout is color sealed, you’ll have time to wipe up spills such as coffee, soy sauce, ketchup, etc. before they become stains, and your regular cleaning becomes much easier. 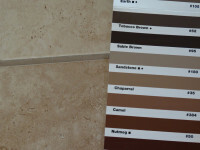 Another unique advantage about the color seal process is that your grout is protected by constant acting mildewcides. The result is a cleaner, healthier environment for your home. We offer a variety of colors and can even come to you, free of charge, and apply a few color samples to your discolored grout in an inconspicuous area. After it dries within 24 hours, you can choose which color you like best. Then, it’s just a matter of ordering the necessary materials and scheduling a day to color seal your grout. We can color seal to match your original grout color, which is a great way to seal and protect while giving your floor a fresh, like-new look, or we can change the color of your grout entirely, for example, from black to white, to give your floor a distinctively different appearance. Contact us online or call 407-947-1416 today to get a free estimate and discuss your color seal options.